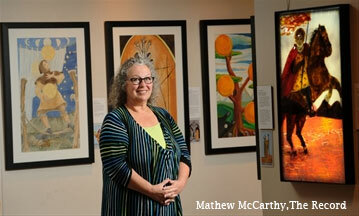 Local tarot reader and enthusiast, Shelley Carter, has always supported local artists. On a tarot tour to Italy and France in the fall of 2011, Shelley met a number of people who had created tarot decks. It seemed a natural development, coming from a community of artists, to have the idea to create a “made in Elora” tarot deck together. A Tarot deck is a perfect venue for a group project – each card is an individual work of art on its own, and then becomes part of a larger piece as a collaboration. Ultimately, 65 artists combined their talents to create the Elora Tarot. An exhibition of the original artworks was held at the beautiful Wellington County Museum, in the fall of 2013. It was wildly successful! In 2018, Shelley created another exhibition called the Tarot Lovers: Works of Heart. The exhibition focussed on the tarot Lovers card, and the concepts of connection over division / love over hate, and diversity and inclusion. 8 juried art works were printed as alternate Lovers cards for inclusion in the Elora Tarot deck. I would love to hear from you – email me.